One of the great things about working, in my day job, with people who make lovely food is that I get to taste it and also get to be a part of thinking about new products and new recipes. So when the team at Peters Yard were getting together for our 2013 planning day I thought I’d try an idea I’d been toying with for some time. Chocolate dipped crispbread. Yes really. Now Peters Yard are no ordinary crispbread. They are made to an artisan Swedish recipe with sourdough starter and simple ingredients. The taste amazing. Watching people be wowed when they first taste them is great. They are the non plus ultra of crispbread, indeed of crackers in general. So I decided to keep it all very simple and not compromise on ingredients. I melted some top quality chocolate (I used Willie’s Cacao Chefs Drops) in a bowl over a pan of barely simmering water. 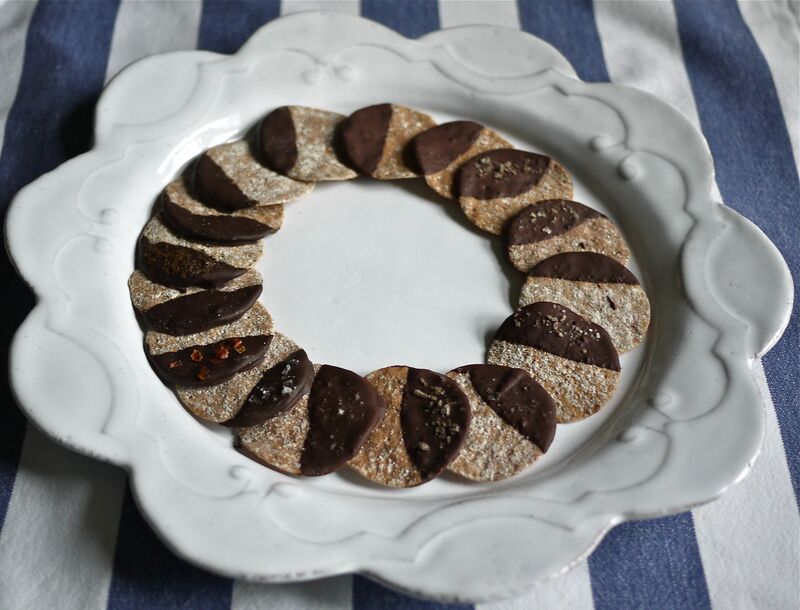 Once molten and glossy I dipped mini crispbread in the chocolate and laid them out on baking parchment to set. I also drizzled some with the last of the chocolate to make squiggly patterns. The team loved them with coffee. The fruitiness of the chocolate complimented the slight sourdough tang of the crispbread. The smooth texture contrasted well with the crispiness. All in all a success. The team suggested that additions of a little sea salt or finely ground coffee beans sprinkled over when the chocolate was setting would also be good. So I’ve done a second batch and I’m about to try them now. I think they would make great end to a meal as ‘petit fours’ or as a gift to someone. They will last about two weeks or so in carefully sealed box or tin. Because they took about 10 minutes to make and only about an hour completely to set I also think they make a wow plate of indulgence at anytime. For really good instructions on melting chocolate take a look at this article in the Guardian. I would say that because the crispbreads have a little coating of flour you are never going to get a super glossy result so go with the bowl over water or microwave option. If using a microwave be very careful and do short bursts and keep checking, if you overheat then the chocolate will go granular, it will taste fine but be harder to work with. Disclosure: Peters Yard is a client of my business Bright Blue Skies. The crispbread had been provided for free. The chocolate drops I bought in Waitrose.